Festival HQ & Ticketing - 216 W Broughton St.
Festival Headquarters is where everyone will start their Stopover journey! Here is not only the place where you buy or pickup your festival passes and wristbands – visiting the HQ you can grab a pocket guide, ask a question or find out more about anything Stopover! During Festival week, visit Festival Headquarters for all ticket questions. NOTE: All purchased passes must be exchanged for wristbands at HQ. Paper tickets will NOT gain you admittance into venues. The Ships of the Sea Maritime Museum, founded in 1966, features nine galleries of ship models, maritime paintings and artifacts that reflect Savannah's maritime heritage. It’s housed in the William Scarbrough House which was built in 1819 and is one of the few surviving American works of architect William Jay. Ships of the Sea is also home to the largest private gardens within the historic district of Savannah. Whether you visit the Museum by walking along the fig-covered wall to the garden gate or arrive by car, the visitor's first impression is a riot of color, seen in the flower beds at the entrance. Stopover concerts will take place in the recently built North Garden. NOTE: Ships of the Sea has limited parking spaces free to attendees. All Ages. No outside beverages allowed and no smoking. Guests are subject to bag search upon entering the venue. The Wayward Bar isn’t your typical local watering hole… it’s an experience. Harnessing a vibe of punk, glam, garage, and rock and roll—everything about Wayward is an unexpected turn of expression. Nestled inside Perry Lane Hotel in Savannah’s Historic District, The Wayward Bar invites you to throw social norms out the window and relish in the ebb and flow of the Wayward way. Catch shows there on Thursday and Friday, and play some arcade games while you’re at it. 21+ Must bring valid, government issued ID for entry. At the all-weather, open-air Peregrin, the world is at your fingertips. From exquisite views of the cityscape from the rooftop deck, atop Perry Lane Hotel in Savannah’s Historic District, to hand-crafted premium cocktails and a curated wine list, the Peregrin experience is modern sophistication at its best. Join us for an exclusive VIP event showcasing the best views you’ll see in Savannah. 21+ Must bring valid, government issued ID for entry. Credentials required for entry. We're happy to have Barrelhouse South back as one of amazing Stopover venues for 2019. They carry all your favorite drinks and have plenty of room to hang out and just have a good time. Unique lighting, some of the hottest tickets in town, and a few big screen TVs to watch the game — what more could you want? Savannah's favorite boozery and musiquarium, The Jinx is housed in the same building as the infamous Velvet Elvis from back in the day. Open on Congress Street since 2003, The Jinx showcases the best in local and regional acts of all genres. Voted by Connect Savannah readers as having the BEST BAR STAFF and BEST PLACE TO HEAR LIVE MUSIC. El-Rocko Lounge - 117 Whitaker St. Step back into the 70's and tear up the dance floor! With our beloved Hang Fire gone the owner, Wes Daniel, took it upon himself to open up a new space right down the road. El-Rocko is fully equipped with barrel-aged draft cocktails, a free vinyl jukebox, pachinko machines, vintage photobooth and gold glitter galore! Club One was home of the late The Lady Chablis and a boisterous, multi-level nightclub known for dancing, drag shows & a basement video bar. Savannah Stopover will be taking over the Main Floor of Club One for some exciting high-energy acts. Congress Street Social Club - 411 W. Congress St. The Congress Street Social Club (CSSC) is the perfect place to enjoy tasty food and beverages in any kind of setting you'd like. With 3 different full service bars, you can enjoy the fresh air and a craft beer on the patio, choose from 121 bourbons while you're up close and personal to the indoor stage, or snack on delicious food while you play a variety of games down in the basement. Oh, AND, there's a photo booth! Great Food. Great Drinks. Great People. CSSC is all ages for afternoon shows until 9pm, and 21+ only for evening shows. All Ages until 9pm. Must bring valid, government issued ID for entry after 10PM, and for alcoholic beverages during the day. Service Brewing Co. - 574 Indian St. 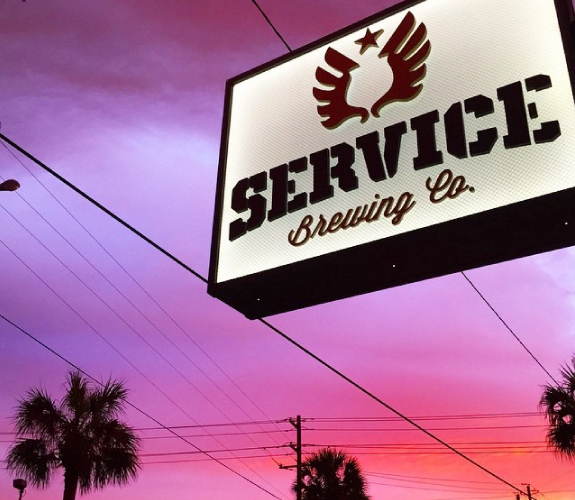 Stage Sponsor: Service Brewing Co.
21+ Must bring valid, government issued ID for entry. No outside beverages allowed. Occupying a 1938 art deco Greyhound Bus Terminal that they painstakingly restored to its original luster, The Grey offers a food, wine and service experience that is simultaneously familiar and elevated. Stopover started a partnership with them two years ago during the festival which has translated into a year long relationship with what we’ve called “Stopover in the Yard”. This monthly series takes place throughout the year on a Saturday and combines the delicious lunch from The Grey with great live music! All Ages. No outside beverages allowed and no smoking.